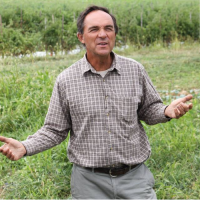 The Perry County Chamber of Commerce has selected Michael Brownback of Spiral Path Farm to be its keynote speaker at the 2019 Annual Dinner on Friday, April 5, 2019, from 6:00-8:00 p.m. at the community building at Little Buffalo State Park. About Mike Brownback: Mike Brownback is Spiral Path Farm’s co-owner and a 1st generation farmer since 1978. His current farm duties include serving as general farm manager of composting and vermicompost operations, farm fertility systems, master seeding schedule, organic certification, tractor work, and mentoring next generation farmers. In his spare time, Mike enjoys building projects using recycled old wood and working with stone. About Spiral Path Farm: Spiral Path Farm is committed to building the fertility of their soil and the health of their farm and surrounding woodlands. They strive to provide fresh, wonderful tasting produce, loaded with nutritional value, to their customers. Spiral Path Farm serves CSA members in Central Pennsylvania and at their Farmers’ Market locations in Bethesda and Silver Spring, MD. They also grow, pack, and ship certified organic produce wholesale for Wegmans. For complete information about Spiral Path Farm, please visit www.spiralpathfarm.com. About the Perry County Chamber of Commerce: established in 2009, the Perry County Chamber of Commerce currently serves more than 250 member businesses, nonprofit organizations, and individuals with a range of advocacy, educational, and networking services. The Perry County Chamber has a series of events planned throughout 2019 to commemorate their “Decade of Growth.” For more information about the Perry County Chamber of Commerce, please visit www.perrycountychamber.org.